Robert William "Bob" Barker (born December 12, 1923) is an American retired television game show host and animal rights activist. He is best known for hosting CBS's The Price is Right from 1972 to 2007 and for hosting Truth or Consequences from 1956 to 1974. Barker was born Robert William Barker on December 12, 1923 in Darrington, Washington. He is of Sioux descent. Barker studied at Drury College. Barker started hosting Truth or Consequences on December 31, 1956 and continued with the program until 1974. On December 4, 1957, Barker began hosting a new Ralph Edwards creation, the short-lived End of the Rainbow for NBC. In 1967, Barker hosted the short-lived game show The Family Game. In 1971, Barker began creating a TV pilot for a game show called Simon Says. In 1980, Barker hosted a series called That's My Line for Goodson-Todman. It was cancelled in September 1981. On September 4, 1972, Barker began hosting the CBS revival of The Price Is Right. On October 15, 1987, Barker did what other MCs almost never did: renounced hair dye and allowed his hair to turn gray. In 2006, The Price Is Right marked its 35th consecutive year on the air. It is the longest-running game show of all time in North America, and at the time was the last surviving show in the daytime game show genre. On October 31, 2006, Barker made his announcement that he would retire from The Price Is Right in June 2007. He taped his final episode on June 6, 2007, with the show airing twice on June 15. He was also seen acting as himself in the 1996 Adam Sandler comedy movie Happy Gilmore. He is the winner of nineteen Daytime Emmy Awards. Barker won the MTV Award for Best Fight with Adam Sandler for his fight scene in Happy Gilmore. Barker married Dorothy Jo Gideon in 1945. They had three children. Barker lives in Los Angeles, California. Despite retiring from television, Barker is an active animal rights activist. In 1993, Dian Parkinson sued Barker for sexual harassment. She asked for $8 million during the lawsuit. The lawsuit was dropped in 1995. Barker is a skin cancer survivor. On September 17, 2010, Barker collapsed at an L.A. shooting range. He was treated at Cedars-Sinai Medical Center for an adverse drug reaction and released. Barker broke Johnny Carson's record for continuous performances on the same network television show with twenty-nine years. 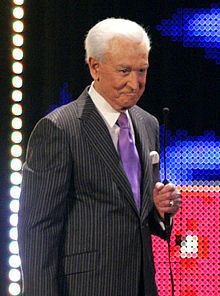 ↑ Bob Barker Biography - Game Show Host, Animal Rights Activist. Retrieved 30 April 2016. ↑ McNeil, Alex (1996). Total Television. (4th edition) Penguin Books. p. 867. ISBN 978-0140249163. ↑ KING, SUSAN (8 July 1990). "Bob Barker Wins the Game of Endurance" – via LA Times. ↑ Keveney, Bill (November 1, 2006). "Bob Barker, 82, to retire". USA Today. Retrieved September 4, 2012. ↑ Adalian, Josef (May 22, 2007). "Barker's final 'Price' airing June 15". Variety. Retrieved May 24, 2007. ↑ "Filmreference Bob Barker Biography (1923–)". ↑ "Bob Barker Has Skin Cancer Again". CBS News. February 11, 2009. Retrieved September 4, 2012. ↑ "Bob Barker hospitalized after collapsing in LA shooting range". Allvoices.com. September 17, 2010. Retrieved September 4, 2012. ↑ "Bob Barker Fast Facts". CNN.com. Retrieved February 8, 2014.